Time to time I buy supplements and gear from a particular company. Instead of writing separate reviews for everything I bought from them I prefer to put them on one post. And that is what we are going to do for the Sports Research Company. A couple of months ago I was looking for a new collagen powder. The Primal Kitchen Collagen I had been using was very good but it did not last long. What I really wanted was something I could add into my morning Shakeology. A quick search and I found the Pure Hydrolyzed Collagen Peptides from Sports Research. There were a lot of positive reviews. So I bought it. The main difference between what I was taking and the Collagen Peptides was this one was unflavored. It was designed to be mixed or taken on its own in a glass of water or coffee. This was what I had in mind. What I also liked was it was Paleo Friendly, Keto Certified, Gluten Free, and was made from Grass-Fed Pasture Raised Cows. Those are all great and were expected. But I liked how it had 41 servings for $30 instead of 12 servings for $40 with Primal Collagen. Its not fair to compare them straight up like that but I wanted just the collagen supplement, not protein and everything else. I was getting those in Shakeology. 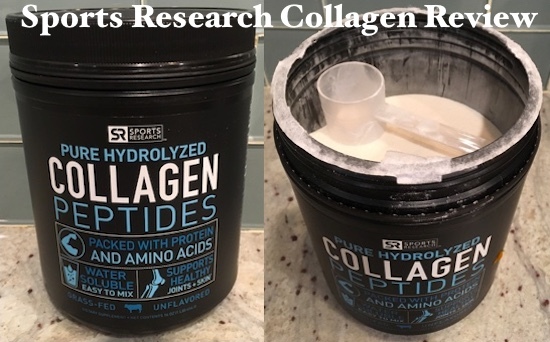 Before taking the Sports Research Collagen Peptides I had been taking my previous collagen in half doses because I didn’t want to go out of it quickly. So while I had been taking some doses of collagen for thirty days prior I don’t know if its enough to make a difference. From what I had read it takes one to two months for the effects of taking collagen to kick in. Lets say I was on day 15 before taking these collagen peptides which took me sixty days to finish. For the first week, I put a scoop in my morning Shakeology and would slam another scoop an hour before bed. At the end of the first week I could tell I was feeling fuller. So I scaled back to just one scoop everyday. It was around the half way point where I noticed my finger and toe nails looking much thicker and longer. I read this might happen but was surprised how they looked. Sorry, no pictures. Feet are gross. A week later I noticed I was not noticing my elbow and knee injuries that I have been dealing with for years. This is exactly why I started buying collagen supplements in the first place. To help with my joints. The pain was not gone but my joints felt looser. And this is the funny part. I swear I could feel my hair growing. No joke. There was this tingling sensation on top of my head that started on day 20 of taking the collagen peptides. It kind of scared me so I saw a Dr. and told them about the tingling. I was told there was nothing they could see wrong. Its been three weeks since I finished the Sports Research Collagen Peptides and I feel it did what it claimed to do. It made a difference with my joints and I noticed my nails and hair growing more than before. I didn’t notice that much difference with my skin. The tingling sensation on my scalp went away a week after finishing the tub. I did not buy another tub after finishing it because I had a 20% coupon at the Primal Kitchen and they finally had the Vanilla flavor in stock which I wanted to try. When I finish it I might buy the Sports Research collagen again. At a minimum, I feel at the age of 37 it would behoove me to continue taking a collagen supplement. What Sports Research has done with their collagen peptides is they have given people an option to save money on a very good product in a large quantity by merely removing flavor. Add flavor on your own with Sports Research or pay a premium for a similar product with flavor and less servings.